Internet giant Cisco on Tuesday confirmed several additions to its digital signage portfolio, including a cloud-based management platform for allowing customers to create, deploy and manage customized signage content across high-definition, touchscreen displays connected by an IP network. Cisco is also announcing new customers that showcase the continued expansion of the digital signage market; customers including parx casino(R) in Pennsylvania are using Cisco Digital Signage Solutions to change how they engage and communicate with their customers and employees. Cisco’s Interactive Services solution set is introducing new web clients and a cloud-based management platform that enable customers to create, centrally manage and rapidly deploy personalized and interactive signage experiences across a network of high-definition and touchscreen digital displays. Through these new offerings, organizations can deliver a variety of customizable content to each endpoint that can be highly targeted for various audiences and can be delivered at the most optimal times of the day for maximum impact. So, for example, from a single display, an end user could conduct digital transactions that are relevant to what’s being shown, like ticket purchases, or visit Web pages and applications that could provide additional information. The innovations also provide advertisers with an opportunity to personalize advertising based on the content the user is viewing, their location or a programmed schedule. Through Cisco Interactive Services, viewers are provided with an enhanced user experience with new hands-on features such as a virtual keyboard and intuitive, touch-based scrolling capabilities. These capabilities enable viewers to directly engage with the content on a digital display, and find the relevant information they require. Cisco and its customers are embracing these innovations at a time when the digital signage market is evolving — from static content on traditional screens to customized rich media content delivered on a multitude of connected devices. As a market leader in digital signage, Cisco’s strategy is to drive this new era of interaction and engagement. With a broad portfolio of media endpoints, video infrastructure and digital signage management software on a network-based platform, Cisco is uniquely positioned to broaden the use of digital signage into a medium for two-way interaction. When deploying these new solutions, Cisco’s medianet architecture enables organizations to create a video-optimized network that reliably delivers optimal quality video content, with high security to any network device. –The Cisco Interactive Experience Client (IEC) 4600 Series, including the IEC 4610 and 4632 models, are networked clients that provide enhanced interactive capabilities to high-definition and touchscreen displays. Each IEC hosts a Web browser specially designed for digital displays, to support a variety of content including localized information, existing Web portals and Web applications, RSS feeds, advertising, and live video and collaboration capabilities. 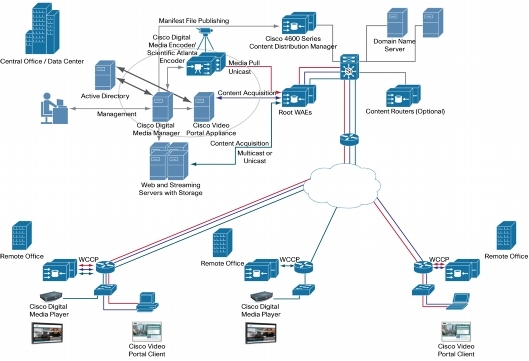 –All of this content is managed and distributed through a central management platform, the new Cisco Interactive Experience Manager (IEM), part of Cisco’s digital media management software suite. The IEM is a centralized Web portal that helps customers easily scale management of Cisco interactive experiences enabled with an IEC. Functions include remote monitoring and trouble-shooting displays, managing and scheduling large amounts of rotating video content, and implementing signage templates. –The IEM can be provisioned on an Interactive Experience Platform server at the customer site, and is scheduled to also be available as a cloud-based service. The IEP server is based on a Cisco UCS(R) C-Series C200M2 server and provides the reliability and scalability benefits of the Cisco Unified Computing System(TM) with software optimized for performance. –In September 2011, the Metropolitan Transportation Authority of New York announced it is using Cisco Interactive Services for its new On the Go! Touchscreen travel station pilot program. The On the Go! Touchscreen, deployed at select subway and commuter rail stations throughout New York City, provides riders with an interactive way to access information about their trip, including real-time trip planning, service status, local maps and other information. –Cisco Interactive Services and the new digital signage products are available now in North America, Europe, Singapore, Indonesia, Thailand, Philippines and India, and are scheduled to be available globally by the second half of 2012. –parx casino(R) in Philadelphia, Pa., wanted to create an enjoyable entertainment atmosphere while keeping guests up to date and informed on casino activities. Cisco Digital Signage is enabling the casino to do just that by delivering highly engaging real-time communications and visitor information to their guests. –From large 65-foot displays at the entrance to hundreds of single-screen displays throughout the complex, guests can easily find information ranging from upcoming casino promotions, available amenities, transit schedules, and racing and gaming waiting lists. –Through Cisco’s centrally managed signage platform, parx casino(R) is able to simultaneously manage multiple channels ovideo content and quickly deliver information as needed to any display any time. Video content can be scheduled in advance or changed at a moment’s notice for events or notifications. –Since opening in June of 2011, LIVESTRONG Sporting Park in Kansas City, Kan., has been committed to delivering a unique fan experience through high-definition video, digital content and new interactive applications for fans. –Utilizing Cisco StadiumVision(R), a special set of offerings for sports and entertainment that amplify any event, LIVESTRONG Sporting Park can instantaneously deliver live video to over 300 high-definition digital displays to bring the action on the field closer to each fan in the stadium. –In addition, each display can highlight dynamic content like team trivia and game information, weather and traffic updates, merchandise and concession promotions and new team sponsorship opportunities. –Since its opening, LIVESTRONG has seen a vast increase in fan engagement and interaction during games and events. Last season saw record attendance, and 2012 will bring seven national televised home games to showcase what has been hailed as one of the most technologically advanced stadiums in North America.